An international team of researchers has assembled data from a genome-wide association analysis of over 1000 twins in the U.K. supporting the hypothesis that some parts of our microbiomes are inherited and shaped—not through a spread of microbes from parent to child, but through our genes. The study results revealed new examples of heritable bacterial species, including those related to diet preference, metabolism, and immune defense. “We set out to find out about human genes that are implicated in the regulation of the gut microbiome, and we found some that are,” noted senior study author Ruth Ley, Ph.D., associate professor in the department of microbiology at Cornell University. Interestingly, the researchers were able to make a connection between the lactase gene (LCT), which is involved in making the enzyme that helps the body digest dairy products, and a type of microorganism called Bifidobacterium, commonly used in probiotics. Moreover, the scientists also found links between specific gut bacteria, blood pressure, and self/nonself recognition. 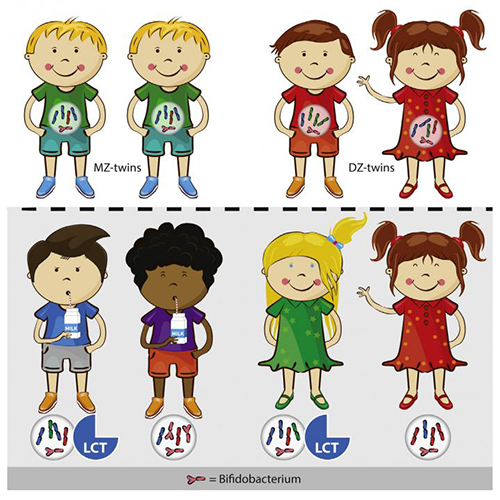 Specifically, the research team analyzed the gut microbiomes of 1126 pairs of twins who were part of the TwinsUK Study. The multiyear research effort, which included a total of 12,000 twins, looked at a number of diseases and conditions. By including data from both identical and fraternal twins who were raised together, the study seeks to account for both environmental and genetic contributions. The twins in the current study already had their genomes analyzed, and 1.3 million small genetic variations (also known as single-nucleotide polymorphisms or SNPs) were known for each participant. The investigators used the genome-wide association approach to look for connections between genetic variations between twin pairs and certain bacterial types that were present and stable in the study subjects.